Mods- I searched and didn't find any topics like this. If there is, then feel free to lock it. I've been thinking about this for a while now. I've always wanted to make a population topic, and I was sparked to post this by reading the Ba Sing Se Population topic. Knowing the city's population can't be properly done without knowing the world's population. So, what do you guys think? How populated are (were) the Four Nations? And what about their cities? How populated are they, and how many cities and towns are there in the nations? And there's another question: Does the FN have huge, smoggy industrial cities with ten story buildings? How many towns and cities do all the nations have? If you want to see it more clearly, go to the Avatar homepage on nick.com. Do you notice all of those little dots on the FN? I believe that those are cities and towns. I counted, and there were about 170 in all. This could help to learn the population of the Fire Nation. I'd be happy to hear your opinions! Proud supporter of Kataang, Sukka, Teoph, and Maiko! For Air Nomads, probably just a couple thousand. I think that the AN traveled a lot, but they all called the temples home. They had a very small population. The water tribes don't seem very big. I'd say 20,000 WT at the most. The entire world well with millions of dying and the population depleting I'd say about...1.5 billion? -Earth Kingdom probably has well over 700 cities with the majority being either occupied...destroyed...or abandon. -Water Tribes...probably 2-3 cities and 10 or more villiages. To answr your question I think that the FN has tons of industrial and smoggy cities...maybe they weren't visted as much but we know that places like "Capital city", "Jang Hui" and "Fire Fountain city" are one of the many who have industrialised. Hmm... well... I highly doubt Ba Sing Se has 300 million people, considering that is about the entire population of the United States. World: Somewhere around 1 billion people, but I bet there were more before. Earth Kingdom: Anywhere from 300 to 500 million seems about right. Fire Nation: Hmmm, well, since there's about 165 cities, I doubt there's 300 million ( that's about 1.5 million people per city) I'd say they have somewhere between 100 and 200 million people. Water Tribes: I don't think that the NWT is the only city at the North Pole. I'm thinking that the entire Water Tribe has between 50 and 200 thousand, but I think the had a much bigger population before. Air Nomads: Many Air Nomads weren't linked to the temples. Soo, I'm guessing they had somewhere between 30 and 150 thousand. And another thing. On the map of the FN, it shows several darker orange-red areas. What do you think these are? They could be forests, but I think they might be huge metropolitan areas. World-150-200 million people I think since the world was probably not too big and populations tended to be rather small in the pre-industrial era. WT-around 10,000 at best in the current state and about 150,000-100,000 before the war. AN- around 100,000-50,000 before the massacre, but it might possibly be around 300,000. I think it should be lower now though, 2 million troops is a lot even for China. Interesting thread. I just visited the BSS thread before. It's an huge archipelago with many forests, a tropical climate, a lot of mountains, many small isles and pretty good shores for both tourism and navy. Judging from it's advanced industry, the FN has a lot of iron reserves which means their mountains are geologically pretty old (younger mountains like the Alps don't have nearly as much resources) but their raw materials might be coming from the EK (still, they had some to begin the war with). Same goes for agriculture, islands are suitable for tropical fruits but not very good for grain and rice which means they're importing a large amounts of these vital resources from the EK in order to support their rather large population. Forests are vital for building and the FN has some impressing infrastructure. Hope they're keeping them in shape. The warm and comfortable climate is very suitable for a large population and their geography can host a good amount of harbor cities. So, remembering the FN skill and resourcefulness, I'd say they made the best out of their heartland and their colonies can amazingly support their welfare. I'd say they have some 100 million counting both heartland and colonies (from what we've seen the EK is very fertile and thus good for a large population). I think they did a good job. Thanks to their efficient and centralized government they have an excellent economy which can both support a large population for their enormous army and all the resources needed (both vital and luxurious). Obviously, the FN gained much from the war and the more they conquer the stronger they get. By the way, EK people under the rule of the FN count as their citizens as well; my estimate (100 million) was for firebenders. Not to forget, the war is only fought on the front line, the EK. The people in the FN heartland were absolutely safe and thus they could grow and prosper. By the way, looking on the FN map I've noticed: If you turn it around 90 degrees left, it resembles a flame. A FN fan! I'm not alone! Well I don't know about you guys but I think Houjiing has a population under two thousand...I seriously doubt that something the size of that city holds that many people. But the urban centers of the FN are filthy rich so I don't see why not. DAMN THE SPOILER WARNINGS, FULL SPEED AHEAD!!!! the water tribes just a couple of thousand???!!! come on! Zhao said: "The water tribe is a great nation..."
Nick says: "the water tribe is a HUGE MULTY TIRED city..."
its not tha size of ba sing se, but I estimate 200 000 to 300 000 thousand people. also the ek and fn dont have to much population. After ba sing se and omashu, the ek is just small villages spread all over the land. the fire nation cities are also small. also the fn capital looks really small. As for your question about the FN cities. There is definitely a lot of industry somewhere but not necessary a settlement near. Industrial zones could be well separated from the cities with the workers commuting to their jobs. After all, the FN has tanks and assault trains so they could use this techs for civil use as well. I imagine those industry zones being more in the depth of the country while the population lives at the shores. The nation definitely had some industry in its heartland to begin the war with. Weapons industry being somewhere in the mid of the land and ship factories at smaller islands or next to big towns. But as the war progressed they gained more and more land from the EK. They could've surely expanded if not moved a part of both their civil and war industry from their mainland. So the FN cities might as well be very clean and beautiful. That's supposed to be the capital, but we've never seen buildings like that there. But that's beside the point. I think that there are cities filled with high-rise buildings instead of little one-story homes. On the note of other nation's populations, I'm sure the EK had more cities than Ba Sing Se and Omashu. However, they were probably taken out early on in the war. We have proof of this: The Abandoned city of Taku. It was an important trade center, so the FN took it out early on in the war. By the way, all of those villages can really add up. As for the Northern Water Tribe, I doubt there are 200 or 300 thousand people there, but there probably are between 50 and 75 thousand people. That's a pretty big population. We really need to ask the creators these questions. The creators have said that the Air Nomads have the smallest population, not the Water Tribes. I am faster than 80% of snakes. Actually we've seen many of those tall building which are at the most outer part of the volcano...the FN capital has many impressive structures but is pretty darn small. Anyway I wonder if the gaang is going to go any more westward, of the FN because that is where all the volcanic hotspots are...which would mean more factories. Now that I think about it I believe the Water Tribes are much, much smaller....maybe less than 30,000. As for the Air Nomads I think it's more around 15,000 or maybe even under 10,000. The FN is small compared to the EK but not THAT small per se. It can contain a sizable amount of structure and they don't necessarily have to have skyscrapers. A lot of FN pop. and structure is spread around the EK too. By the way, skyscrapers are mainly office buildings and the FN has no need for that yet. Perhaps once the war ends and they become a peaceful trading power. As for the EK cities being all destroyed, that doesn't have to be true. The AN were wiped out in order to break the Avatar cycle and the WT were almost eliminated too cause they're a pest for the FN but there's no point at destroying the EK populace and infrastructure completely. In times of war, cities were usually razed in order to intimidate the enemy or when the attackers got pissed by a long siege. But not all of them, no. It's much more economic to pacify or enslave the conquered population and take over the already present structure then destroying it completely and building it up anew. To me, I'd say that the Fire Nation, as it stands, is likely around 25 million people, which is similar to early industrial Japan. The EK is much larger, but its not as densely populated... I'd give it about 150 million people. FN had 30 million pre-war, and EK Over 250 millions. SWT... originally about 1,000,000 people, decades of raids have declined it to less than 100,000. AN... Perhaps 100,000 if you count every nomad living inside and outside the Temples. Present number... unknown. 1- Ba Sing Se-It says in Nick.com that it takes about 2 days to walk from one end of the city to the other. So it would take 2 full days to walk from one end of the city to the other. So that's 48 hours, and it takes a normal person about 30 minutes to walk a mile, so that means Basing Se has a diameter of about 72 miles and that makes the city around 470 square miles. Comparing the city's density to those of the modern Asian cities, it make Basing Se around 6,000,000 people. 2-Omashu, comparing Omashu to the size of Basing, i would say it's around 200,000 people. that puts the Earth Kingdom population at around 10,000,000. 5. Chinese typically put 5% of their population to war, that makes the military of the Earth Kingdom to be around 500,000. 6. The Fire Nation has around 170 cities and towns and villages according to the map. The average town looked to be around 10,000 people. So 10,000 times 170 is around 1,700,000. That puts the Fire Nation at around 1,700,000 people. 7. Fire Nation Capital-compared to the size of the other cities, it looks between 60-80,000 people. 8. Heavily military like countries like North Korea and Hitler's Germany put about 20% of the populous into the military. So the Fire Nation military is around 300,000. 8. 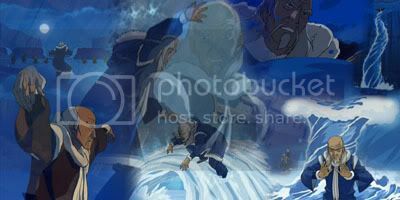 Northern Water Tribe-compared Omashu, it looks about roughly half the size of Omashu, making it around 100,000 people. And the whole population is in the capital city according to nick.com. 9. The Southern Water Tribe has a couple villages in the South Pole. Maybe around 20. Gran Gran's tribe had around 24 people, so the average tribe must have around 50 people. So there maybe only a 1,000 people in the Southern Tribe. But Pre-War, it could have been around 100,000. 10. The southern air temple looked like it could house around 1,000 people, 2,000 in the north, 4,000 in the east, and 6,000 in the western temple. So there may also be around 10,000 air benders as nomads. So there may have been about 20,000 Air Nomads. What the above poster said, 13 million people in the Avatar world sounds more like it. But really think Ba SIng Se might have less people. Afterall, the part which contains the Imperial Section probably has alot of space and not that many people. The middle section had more people but the people were not packed in like the first section were all the poor people lived. So Ba Sing Se, the inner wall, probably had between 3 to 4 million people which would make the world population around 10 to 11 million. Ba Sing Se was populated with refugees, meaning other parts of the Earth Kingdom moved from their homes to be there. Ba Sing Se may be full, but that means other places are empty. 4- Southern Water Tribe: A total that could range anywhere from 10 to 50 thousand. There are several other, probably larger, towns and villages. 5- Northern Water Tribe: Although I posted rather large numbers before, I think that the city has a pretty sizeable population. The views of the entire city show it as small, but it seems from the more close-up pictures that the city is vast and heavily populated. Besides, it has been hinted at that it is a major city.... So I'll put the population at somewhere from 400-600 thousand. 12- Earth Kingdom: Well, I'm guessing that there are about 10 million people in urban areas, including BA Sing Se...this could have been larger before the war started and many cities were destroyed.....For pre-industrial societies, 10-20 percent of the population lived in urban areas, with especially urbanized societies like Rome and China at closer to 20%. Taking into account the large amount of people that moved into BA Sing Se, I would put the population at anywhere between 40 and 50 million. Pre-war, probably 75- 120 million people. 14- Fire Nation: As an industrial society, I'm sure the Fire Nation has a much larger urban population than the Earth Kingdom....Probably 40- 50 percent. Even though we've only seen small villages and towns, the capital is the only location we've seen on the largest island, the capital island. Its kinda been hinted that this island is the center of Fire Nation, and home to many cities. I'm going to put the Fire Nation population at 15-25 million, most likely right around 20 million. There are probably 3-5 million Fire Nation people in the colonies. Okay, the Northern Water Tribe City, the last remaining citadel of the powerful Water Tribe nation, has to house at least as many denizens as the city of Omashu, if not more. I agree with airmaster22, there has to be at least a million people in the Water Tribes combined. The Northern City probably has about 750,000 if not more, and the Southern Continent, which is currently being reunited, is already dotted with about 50 little villages. Sokka's and Katara's village wasn't the only one, there were many more tiny villages. This I read on the nick website or somewhere, and if you think about it makes sense. There used to be a great city down there, so it's only reasonable that the one larger conglomerate broke into many smaller ones. Where do you think all those men came from in the Southern Fleet? Not all from that one village. So anyway, combined I think the Water Tribe has about 1-2 million people. If the Foggy Swamp is counted among them, somewhere closer to 3 million. Keeper of: Pakku's NWT Catamaran For His Southward Journey, Pakku's Amazing Water Spout, The Accepted Betrothal Necklace Pakku Gave to Kanna. Oh I forgot about the Foggy Swamp Tribe.....There have to be around 1 million down there.... And I'm not so sure about the Northern Tribe.....I think the city has at least 200,000 people, but definitely less than 1 million. Of course, thats a huge margin.....More likely it has 500- 600 thousand people. But I think its smaller than Omashu. I don't think it's smaller than Omashu. Omashu is just that one mountain. The Northen Water Tribe has a huge complex and layout; there are several tiers in the city, several more than in Omashu. Also, I mean just making assumptions based on logic, there has to be more people in the NWT than in Omashu. The NWT is the entire WT practically, to for all fairness and justice there has to be at least as many people if not more in that Northern City as there are in the lesser of the two EK strongholds. Also, I've done some counting and such as I watched, and just out of people seen in Omashu vs. the NWT, there are more seen in the NWT. I don't remember the exact numbers, but when I rewatched the Book One finale the several times I did, I took so much time pausing it and rewinding to count the number of Waterbenders and the number of inhabitants seen in the NWT. I did the same for Omashu just for the sake of comparison and there are more people seen in the NWT. Though this may not be the most accurate, it's the best and only thing that can really be done. Anyway, the NWT houses the entirety of the WT, one of the great nations. There has to be at least 700,000 - 1,000,000 people in that city, or the balance just wouldn't compute. That kind of metropolis, one comparable to Omashu has to have that many people. I have to say, though, that all this depends on the global population estimate. I'd put the global estimate at about 500 million, most of those people residing in the EK capital and the rural parts of the EK in general. I'd say there's about 100 million people in Ba Sing Se. That might be a bit high, but it works with the relativity. I'd say there's another 50 million people overall in the rest of the EK, and about 50-100 million people in FN. Placing that many people in those nations leaves a bunch left for the WT, so I have to say that there are at least 1 million people in the NWT city, and then maybe at least 50 - 100 thousand in the SWT. It wouldn't make sense if there were at least that many people in the NWT. Well, 100 million for BA Sing Se's population is much too high. That's a third of the population of the United States. Besides, our worlds biggest metropolitan area is Tokyo, which has 35 million people, and 12 million in the city proper. Most of our world's major cities have populations from 5- 10 million. NYC has 8 million, London has 7 million, LA has 4 million, and Paris only has 2 million. We have to remember that BSS has no high-rise buildings, most being 1-4 stories. It has grown outward more than outward. 6-8 million seems like a probable population for the city. Also, 100 million of a nation with 150 million is a 60 percent urbanization percentage, much too high for any pre-industrial society. Anyways, I still think that Omashu is larger than the Northern Water Tribe. It is composed of 4 hills actually, and they are tall....and the buildings in the city are several stories. And the populations of the four nations are definitely not balanced or equal. Just look at the huge margin between the Air Nomads and Earth Kingdom. Living in the polar regions, the Water Tribe can only support a limited population. I still think the population is around 500,000-700,000. Its horrible how small some landscape pictures show the city as being so small. I'm figuring, just because the city itself is so large, so spread out, that Ba Sing Se holds far more people than any one of our major cities, maybe not 100 million, I was being totally irrational, but I'd say a decent amount more than our cities, which can't be seen from space. This city is practically God-forsaken in size! It's so huge it houses the three rings, the huge palace complex, and a lake the size of a small ocean! I'm just saying, especially with the refugee concentration that there are probably way too many people within those walls. Besides the city itself takes up like a fifth of the whole EK. Other than that, I'm still saying that the NWT city is at least as big as Omashu. There is at least a population of 500,000 in each city, that at least must be agreed upon. I'm not sure which has more (I'm guessing it's about the same) but I'd say that either city could fit up to 1 million people. The NWT is the largest WT city, and it supports life on its trade functioning, so since that has obviously dwindled, I'd say their population was probably once greater and has since declined. That said, with the war's cessation at hand, I predict population spikes for the NWT, the SWT, and the rural EK. The NWT and the SWT will be rebuilt to their former splendor, and the rural EK will see the floodgates of Ba Sing Se open once more to let the refugees return home to work the land. There'll probably be a few more major EK cities popping back on the map as well.